I am over on the Trendy Twine Blog today, and I am super duper excited to share with you the NEW Annie's Paper Boutique Planner stamp set called Hello Fall!!! As you see from my card below, they can be used for more things than planners. I plan on giving this set a lot of use this fall. I love to make treats for the holidays, and I know I will be incorporating this set in my fall treat packaging. I stamped the four images that come in the set onto white cardstock and colored in using copics. I also used the images to create my own patterned paper by stamping the images with a watermark ink onto kraft cardstock. I took a length of Thanksgiving Orange Truffle and wrapped it around several times to add visual interest and texture. I added more Thanksgiving Orange Truffle by creating a double bow which I added to the ribbon treatment at the top of my circular tag. I used a trinket pin to hang my Give Thanks sentiment. Lastly, I added my die-cut pumpkin and flower embellishments to complete my card. That's it for me! 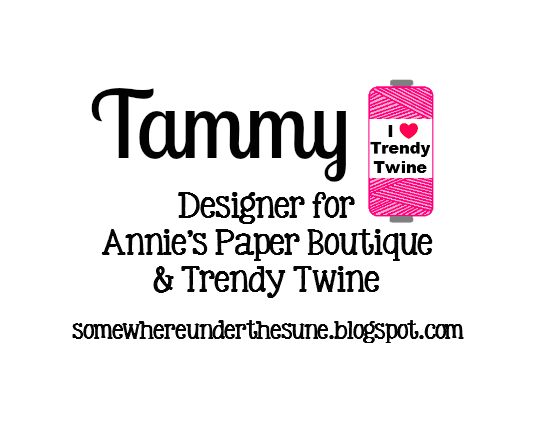 I hope you will stop by the Trendy Twine Blog and Annie's Paper Boutique today! The Hello Fall set is on special for $6.95! So affordable! Gorgeous! LOVING that big pumpkin!!!!!!!!!!!!! Awesome, awesome fall card! I am definitely loving those Hello Fall stamps! Have a wonderful day. This is such an ADORABLE card Tammy!!! LOVE those new stamps! AWESOME fall card my friend! This is so super fun and festive, Tammy! I really love the happy little faces on those Fall images!!! Awww, what a little cutie, Tammy! I love the big pumpkin and the tiny tag and layers of flowers, and LOVE how you used those adorable stamps! The little faces on the images just kill me! Those little happy fall stamps are so CUTE!!! Love the big pumpkin and all the flowers! A gorgeous fall card, Tammy!!! Very pretty Fall card! The way you created the background looks so awesome! You're coloring looks amazing too! Tammy, you did an Awesome job on this fall card! It is Gorgeous!! Layers of autumn cuteness Tammy!! Love the little images along the bottom!! What a super cute card! The little border along the bottom is so darn cute! The faces crack me up! The twine looks fabulous and the flower cluster is perfect! Gorgeous, gorgeous card, Tammy! I love that you added the pretty little flowers! What a perfect fall card! I'm in love with these stamps!